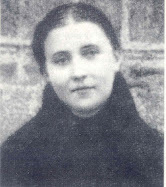 This website is devoted to Saint Gemma Galgani with over 70 articles and many of her writings, along with official photographs and numerous examples of her heroic life, in hopes that it will inspire in others a greater love and devotion for Jesus and Mary. The author endeavors always to be in full communion with the Catholic Church and its teachings. "We have cared for a great many sick people, but we have never seen anything like this" -Comment from one of the Nursing Sisters assigned to Gemma from the order of St. Camillus de Lellis . Today (April 11th) is the feast day of St Gemma--on this day (Holy Saturday, 1902) Gemma departed for heaven to be with her Jesus and His blessed Mother. St Gemma, pray for us! "I have been present at many death beds, but never have I seen anyone die like Gemma, without any precursor sign...not even a panting breath. She died with a smile which remained on her lips, so that I could not convince myself that she was dead. "-Rev Abbot Angeli, parish priest. This blessed death happened at approximently 1:30pm, on Holy Saturday, April 11th, 1903. 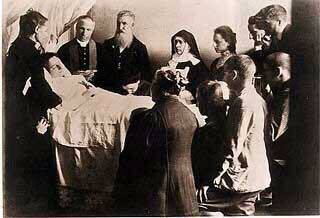 Gemma had once said to her Aunt "I have asked Jesus to let me die on a great Solemnity. What a wonderful thing to die on a great Feast!" Yes, what a wonderful thing it is to die on Holy Saturday, the Solemnity of Our Lord's Ressurection (Vigil of Easter), after having kept Good Friday on the Cross with Him, sharing in all His agony!" What a beautiful and Glorious Saint.Praise be to you Glenn for such a wonderful and devoted website in her honour.I said the 9 day novena to prepare for her feast this morn and offered up my communion in her memory. 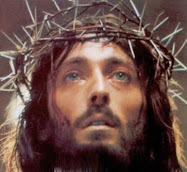 'The Gem of Christ,'The Passion Flower of Lucca' pray for us. "I wish, oh Jesus, that my voice could reach to the ends of the world, to call all sinners and tell them to enter into Thy Heart....Oh, if only all sinners would come to Thy Heart!... Come! Come sinners, do not be afraid! The sword of Justice cannot reach you Here!" 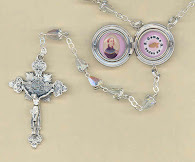 Beautiful relic rosaries & lockets now availible in the St Gemma giftstore! Oh holy Gemma, I am near you, help me to pray. You know what I and those near me need: look after my urgent needs and my spiritual and material wants. 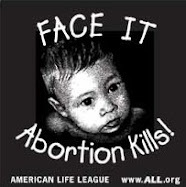 You take care of them! I confide in you and entrust all to your loving care.Offer up to Jesus that tender and constant care that you bore Him here on earth.Oh holy Gemma, you who physically suffered all the pains of the Passion of Jesus, I beseech of you the grace to meditate on and live the Passion of Jesus, and the sufferings of Holy Mary. Pray that I will be able to walk in the path of humility, simplicity, love and sacrifice, fulfilling at all times and in all ways, the holy will of God. Let me live united with Jesus, the Blessed Virgin Mary, and you, for all eternity. Amen.